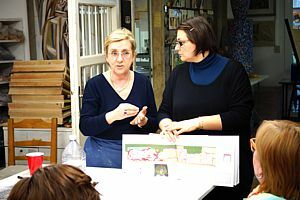 Luciana Notturni, founder of the Mosaic Art School, has been teaching Mosaic Restoration for more than 20 years at the “Scuola Nazionale del Restauro“, that was the most important institution of the world (unfortunately it was closed a few years ago for lack of fundings). 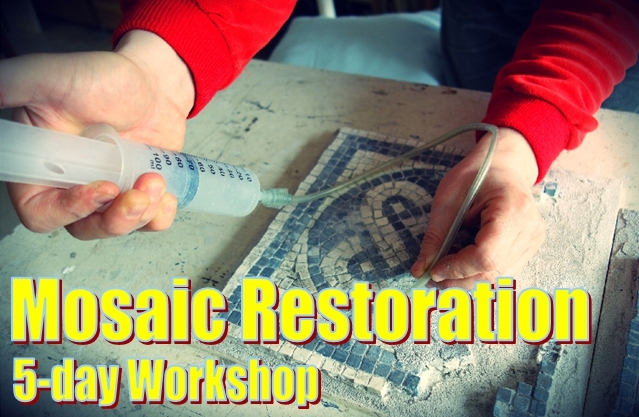 After a long preparation, Luciana has finally arranged this intensive class, where in 5 days the participants learn the rescue techniques for the conservation and stabilization of mosaics. It is probably the first course of its kind ever offered in the world. The workshop is intended for CONTEMPORARY MOSAIC ONLY, since the conservation of ancient artworks is committed exclusively into the hands of qualified personnel. The preservation of a contemporary work does not depend on age, but on other factors such as materials, technique used, and the exposure condition and its use (artifacts, paintings, flooring, sculptures, street furniture , architecture, etc). MOSAIC TOUR: visit to a real restoration site, if available. Description of the most important techniques used over the last 200 year. Extensive overview of materials. Direct and Indirect methods. Visual analysis on the pieces to restore: assessment the state of preservation, observation and analysis of the problems, nomenclature of degradation. Analysis, how to arrange an intervention project, techniques, work phases. Mechanical, physical, and chemical cleaning. Use of tools, and chemical solutions. Chemical compresses. Methods for fixing and integrate the gaps: custom tiles, dummy tiles, filling materials. Hands on practice.